WGS' new Wild X series of slots games is about to shake up the slots world with Wilds that trigger amazing features and massive multipliers. 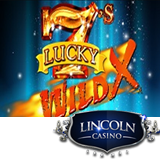 The first game in the series, 7X Lucky Sevens, has just arrived at Lincoln Casino. The new three-reel slot with a must-win progressive jackpot is now in both its online casino and mobile casino. In 7X Lucky Sevens, Wilds in winning combinations multiply wins. One Wild wins a 7X multiplier. Two Wilds and the multiplier leaps to 49X the triggering bet. Wilds trigger 7X and 49X multipliers. The game’s most exciting feature is its guaranteed progressive jackpot. 7X Lucky Sevens’ jackpot is guaranteed to pay-out by the time it reaches a value of $25,000. As the jackpot value gets closer to this must-win threshold, the odds of a trigger get shorter. The Double-Up Gamble feature gives players a chance to double their win. Lincoln Casino, which welcomes players from all over the world, has nearly 200 unique games from WGS: 3-reel slots, 5-reel slots, video poker, Blackjack and Roulette. It will double your first five deposits.